So I made dinner last night for the first time in…well, I’m tempted to say the first time ever that wasn’t prompted by a “Kaity, you’re making dinner tonight, so make [insert super-easy-to-make-meal here]”. It’s not that I don’t know how to cook. Although I haven’t spent a whole lot of time preparing meat (something I will definitely be working on over the summer), it’s not like I don’t know how to cook pasta or toss a salad. However, being the nearly 22 year-old I am, I figure it’s about time that I make the effort to actually know how to cook well. I’m all about being a well-rounded person and acquiring a variety of skills, and cooking, well, is pretty essential…if I ever expect to run my own home without spending a boatload of money. Right? 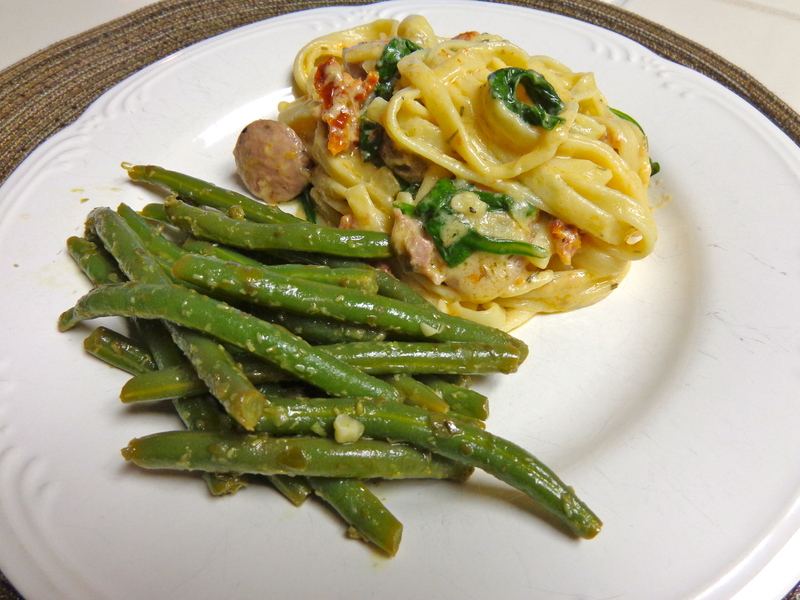 Spinach & Feta Chicken Sausage Fettuccine with Garlic-Caper String Beans! 🙂 It was very yummy, I must admit. I made a royal mess of the kitchen, which my gem of a brother had to clean up (note to self: learn how to “clean as you go” next), but everyone seemed to like it well enough. One thing I’ve never been good at with cooking is timing and making sure everything is done around the same time without going cold, and this time everything worked out just peachy, so I was satisfied. Now I just have to figure out what will be on the table for next time! Do any of you remember the first full meal you ever made? p.s. If any of you are interested in this recipe, the fettuccine dish can be found on p.109 of the June 2012 Food Network magazine, and the string beans are on p.118 of the same issue. Happy cooking! This entry was posted in Uncategorized and tagged cooking, dinner, food, food network, learning, mess, pasta, recipe by Kaity. Bookmark the permalink.